Paper Towns – anything familiar? DJ Big Pop Rocking the party! Bring a lawn chair, enjoy the music and good food and drink. 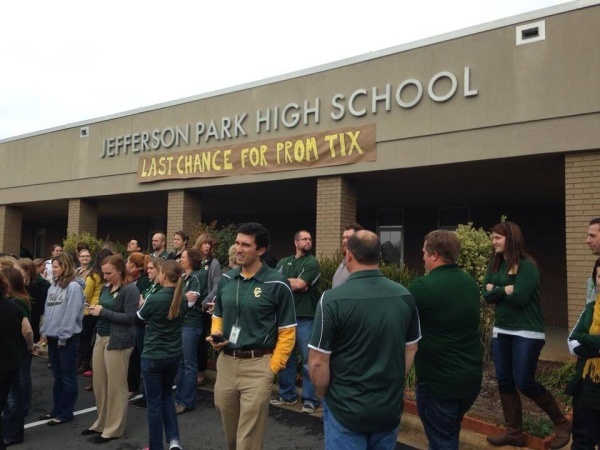 If you see anything familiar in the movie Paper Towns, that opens this weekend, it may be because the high school scenes were shot at Central Cabarrus High School in Concord last December. Check out Sunday’s Independent Tribune for a story and more photos from the filming. Make-up, fashion and of course fun! CHARLOTTE – One of the Charlotte area’s signature annual events returns for three days this August. For the third consecutive year, the Charlotte Southern Women’s Show, now in its 33rd big year, will be held at the centrally located Charlotte Convention Center Aug. 28-30. The show remains an affordable way to get professional advice on everything from hair care to healthcare. Guests can get in the show for as little as $5 with a light rail ticket stub. Ticket prices remain the same this year as last. Fashion. The Boulevard will present “Fashion Forward Without Breaking the Bank” on Sunday, Aug. 30 at 1 p.m. on the Fashion and Entertainment stage. Belk will showcase fall’s fashion trends at a Fall Fashion Preview during Girls’ Night Out on Friday, Aug. 28 at 6 p.m. Front-row seats will be given away through a Facebook contest at facebook.com/swscharlotte. Those front-row VIPs will also receive a special gift bag from Belk. The first 300 people who come to the Fashion and Entertainment Stage that evening will receive a Belk gift bag. Also during Girls’ Night Out, guests can register to win a 3.5-carat diamond tennis bracelet. The drawing will be held at 6 p.m. at the Fashion and Entertainment Stage. Canvas, a Boutique, a shop that opened last December in Latta Arcade, will have a “Fall for Me” fashion show on Sunday, Aug. 29 at 3 p.m. Sisters Julie Brewer and Jackie Sherard own the upscale boutique specializing in pieces – from women’s clothing to accessories like jewelry and purses – not available elsewhere in the uptown area. The Charlotte Fire Department will feature firefighters in the 15th Annual Firefighter Fashion Show on Saturday, Aug. 28 at 5 p.m. and Sunday, Aug. 29 at 2 p.m. See some of CFD’s finest show off the latest in men’s fashion. Celebrity. Melinda Bates is the only person in history to run the White House Visitor Office for all eight years of an administration. She arranged state dinners and the annual Easter egg roll on the lawn and escorted dignitaries including the Queen of Sweden and the Grateful Dead. Bates is the author of White House Story: A Democratic Memoir, a look at life and work behind the scenes with President Clinton and Hillary Rodham Clinton. Entertaining at the White House from George Washington to Barack Obama: Dress swords to gate crashers! Saturday, Aug. 29 at 10:30 a.m.
Back Stage With First Families: Presidents, First Ladies and their frequently misbehaving children through the 215 years of this family home. Saturday, Aug. 30 at 12:30 p.m.
Jessa Duggar Seewald of TLC’s 19 Kids and Counting will appear Saturday, Aug. 29 on the Fashion and Entertainment Stage. Seewald recently wrote Growing Up Duggar: It’s All about Relationships with three of her sisters. She and her husband are expecting their first child. World Vision is bringing Britt Nilsson from The Bachelor and The Bachelorette to the Fashion and Entertainment Stage on Saturday, Aug. 29 at 3 p.m. and Sunday, Aug. 30 at 12:30 p.m.